The 2016 blizzard that brought East Coast cities to a standstill and caused flooding in New Jersey during the weekend of Jan. 23, 2016 was captured in powerful videos. The footage showed time-lapses of landmarks covered in snow and first-person video shot while driving through dangerous floodwaters. Lighter moments included epic snowball fights and animals frolicking in the snow. And then there was the guy who demonstrated how to shovel on a hoverboard. Take a look at top videos from the storm shared on social media. Video shot from a drone on Long Island, New York, shows the scenery after the blizzard hit the weekend of Jan. 24, 2016. The aerials show Coram, Selden and Farmingville. After the snow settled, some brave souls across the East Coast took the opportunity to dive head first into tufts of snow wearing only bathing suits and caps. People gathered in Times Square during the blizzard for a snowball fight over the weekend of Jan. 24, 2016. The Barnegat Police Department posted video of a humvee driving through coastal flooding in New Jersey. A mandatory evacuation was in place. Images From Worst Blizzards to Hit Northeast U.S.
Police officers in Washington, D.C., joined a pick up football game during the snow storm on Jan. 23, 2016. Over a foot of snow had fallen at the White House as of this video on Jan. 23, 2016. Take a look at this time-lapse view of the snowfall. Stephanie Pola in Washington, D.C., posted video of her dog running around in the high snow, Jan. 23, 2016. The award for most unique way to shovel goes to Adam Szyfman of New Jersey, who not only shovels his deck while riding on a hoverboard, but wears a banana hoodie to boot. Clever. The National Zoo was closed on Jan. 23, 2016, but the zoo keepers let Tian Tian out to roll around. By 9 a.m. on Jan. 23, 2016, the snow had reached 2 feet in parts of Washington, D.C. A snow storm turns into a blizzard once it reaches certain levels of snow and low visibility. Towns across New Jersey were dealing with flooding and one town saw flooding at a half a foot higher than during Superstorm Sandy. 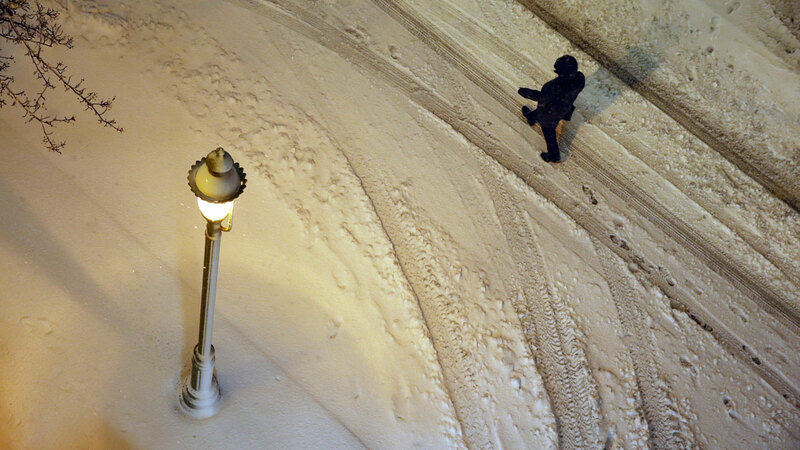 Early on in the snowstorm, this little dog was having a good time in Washington, D.C.